Broccoli is a green vegetable that looks like a mini tree. Coming from the cabbage family, broccoli packs a lot of different nutrients and is a great way to include greens in our diet. It is a powerful antioxidant and rich in fiber, vitamins and iron, making it a super vegetable. This vibrant green vegetable should be eaten only when green. If it is yellow in color, it means it is losing its nutrients. Kids generally don’t like green vegetables but this is definitely the one they like. Adding broccoli to subzis gives them a unique taste and a pop of color. A different combination of Broccoli, Carrot and Paneer subzi works because of all the different colors and textures work great together. A Spicy Broccoli Subzi is also a delicious dish where broccoli is the hero and the gravy is thickened with roasted chana dal and urad dal. Broccoli, being such a fun vegetable, works great when added to parathas. You can either puree it and add it to the dough itself like in Broccoli Paratha or mix it with some cheese and put it as a stuffing like in Broccoli and Cheese Parathas. Some people find broccoli a little bitter but nevertheless it is used in many recipes with other ingredients and make for excellent snacks. We've already seen the combination of broccoli and cheese works well in parathas but also works in Cheese and Broccoli Tikkis. Broccoli can also be stuffed in potatoes and baked with a little cheese to make Baked Potatoes with Broccoli and Red Pepper. The same way, this broccoli mixture can also be stuffed into mushrooms. Another great snacking option is to eat stir fries. Chickpea, Broccoli and Carrot Stir fry packs a punch of protein along with the crunch of the veggies. For another variation, you can add any vegetables you like but one of my favorites is Broccoli and Baby Corn Stir Fry sautéed with garlic and onions. Broccoli soup is a superb way to satiate your snack cravings. There can be various aspects to it as well, you can add almonds or walnuts to make it richer in taste. If not this, broccoli can be used to make super creamy dips which can be had with wafers. An off-beat dip would be Broccoli and Mushroom Dip which is super creamy and rich or you can change it up a bit with Chunky Broccoli and Corn Dip that even be made in the microwave. This vegetable is used extensively in international cuisines ranging from Italian and American to Thai and Chinese. Hot Garlic Sauce with Baby Corn and Broccoli is a Chinese gravy and vegetable served with a hot sauce in garlic. Another Chinese recipe that is delectable is Mushroom, Broccoli and Noodle Salad in Hot and Sour Dressing, which as the name suggests, is filled with different flavors and textures of kinds. You can even add a twist to the classic hakka noodles by adding broccoli. Together with cauliflower, a creamy sauce and a freshly made pie crust, the Cauliflower and broccoli pie is an absolute winner in terms of taste and texture. Mexican flavors come together beautifully in Broccoli, Bell Pepper and Cheese Quesadillas which makes it the perfect combination of bright colors and tastes. Who knew so many different types of recipes can be made with this ingredient. For example, a Barley khichdi with broccoli makes a healthy and innovative dish. Adding a lot of veggies in a roti and making Bean Sprouts and Veggie Wrap not only covers the health portion, but also is super tasty in and fun to eat. The previously mentioned tikkis can be transformed into a make shift falafel with a simple addition of garlic chutney and onions and tomatoes and make Broccoli and Cheese Tikkis in Pita Pocket. 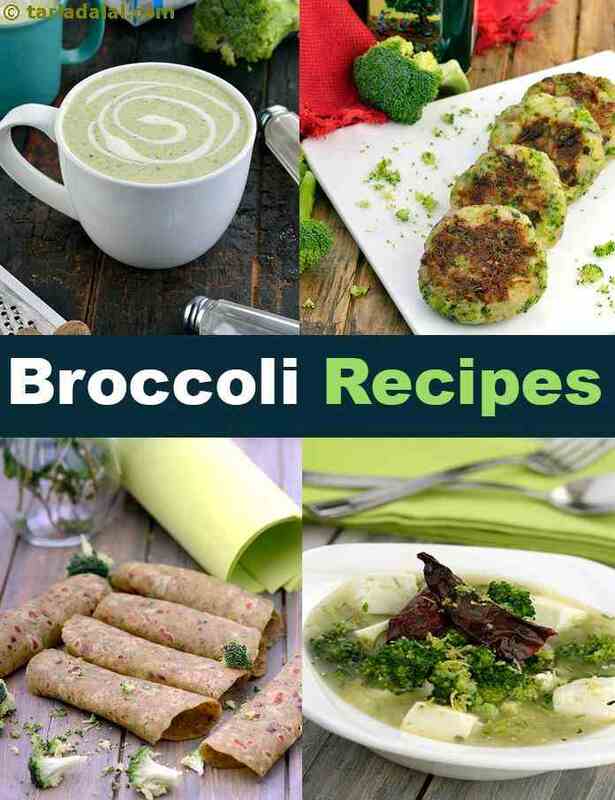 Enjoy our broccoli recipes vegetarian collection below.